Zagreb, July 13th 2016. – As part of BalCannes, for the first time in the region, advertisers will choose the best projects and the best marketing agencies from Croatia, Slovenia, Bosnia and Herzegovina, Serbia, Macedonia and Montenegro. The expert jury is made up of the best and most experienced marketing specialists, who have been carefully selected for this task: Darko Ivančević, Director of Marketing at Zagrebačka pivovara; Selma Riđanović Kenović, Director of Marketing and Communications at UniCredit Bank; Simon Furlan, Director of Marketing at Telekom Slovenije; Snežana Teodorović, Director of the Marketing Department in charge of snack in Atlantic grupa and Zdenka Milanović, Marketing Manager of Pivovara Skoplje AD Coca-Cola Hellenic & Heineken JV. The jury of advertisers will go through all the applied projects and pick the top 25 which will be presented at the Weekend Media Festival in Rovinj. The best agency, the best project and a special BalCannes prize will also be given out. During the voting procedure which will have two rounds, advertisers will not be able to vote for a project from their own country which will additionally ensure impartiality in the judging. Along with the advertisers, all projects will also be judged by a panel of journalists who follow the advertising industry: Ekrem Dupanović, Editor in Chief of Media Marketing; Ivana Parčetić Mitić; Founder and Editor of Marketing mreža, Marjan Novak, Editor in Chief of Marketing Magazin EU; Boris Eftimovski, Editor in Chief of Marketing365 web portal and Ivan Brezak Brkan, Founder and Editor in Chief of Netokracija. The journalists will give out a special award for the best project in the past year, according to their opinion. This selection will give the best insight of the current market, organizers of BalCannes, HURA (Croatian Association of Communications Agencies) and Weekend Media Festival agree. BalCannes applications will be open from September 1st 2016. For applications and more information please visit www.balcannes.com. 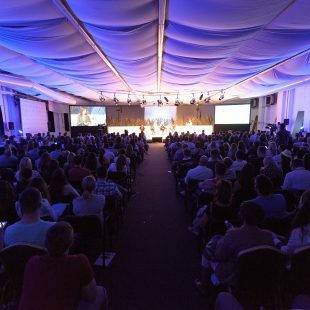 The ninth edition of Weekend Media Festivala, the biggest regional communications festival, will take place from September 22nd until September 25th in the old tobacco factory in Rovinj, under the sponsorship of Adris grupa, and will bring a plethora of new business topics with over 120 speakers, over 4000 media, marketing and PR professionals, 350 students and almost 600 accredited journalists who will be able to enjoy many interesting and current lectures, panel discussions, workshops and presentations from the world of media, PR, marketing and the entire communications industry.